Apply the code below to an object that rotates like a clock hand would (pole4m.rwx, p1rec0025d.rwx, etc). You will have to make three hands, with each hand containing the code below. 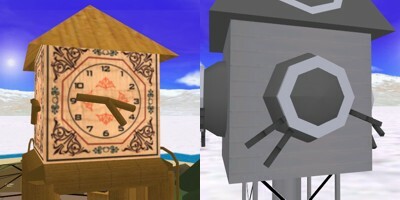 The code below syncs up to the universe clock, so they will represent the correct time in-world. For clocks facing directly South and West, the rotation numbers will be positive. For clocks facing directly North and East, the rotation numbers will have a negative added infront.